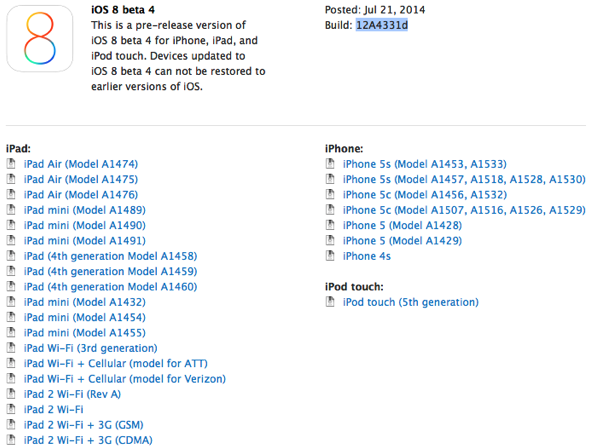 Apple has officially seeded the latest beta version of iOS 8 Firmware i.e. 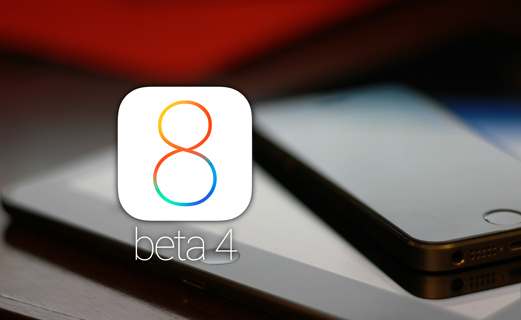 iOS 8 Beta 4 (Build: 12A4331d) for iPhone, iPad, iPod Touch and Apple TV devices running an old iOS 8 Beta 3 firmware. The new iOS 8 Beta 4 released is available to iOS developers and non-developers (general public) for updation / upgradation instantly. You can Download iOS 8 Beta 4 Firmware IPSW for iPhone 5S, iPhone 5C, iPhone 5, iPhone 4S, iPod Touch 5G, iPad Air 5G, iPad 4G, iPad Mini, iPad Mini 2, iPad 3G, iPad 2G and Apple TV 3G via Direct Links mentioned below. According to the official Apple iOS 8 Beta 4 (Build: 12A4331d) Firmware Update changelog; iOS 8 Beta 4 Update contains few major conventional bug fixes, system performance improvements, stability, enhancements with the addition of new features and functionalities changes etc. The prerelease iOS 8 Beta 4 version expires on 4th September, 2014. Apple has also seeded and updated the other software platforms as well i.e. Apple TV Software v7.0 Beta 3 Update, Xcode v6 Beta 4, Command Line Tools v6.0, Apple Configurator v1.7 Beta 3 and iTunes v12.0 for Mac OS X and Windows operating systems. 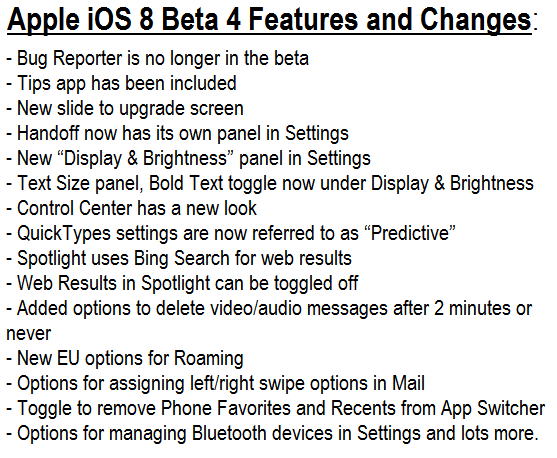 How to Jailbreak, Download & Install iOS 8 Beta 4 Manually? 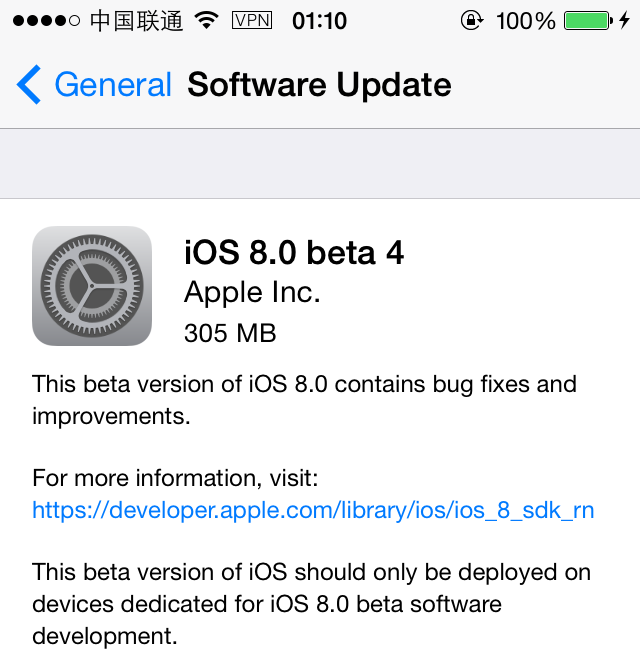 Apple iOS Device users can upgrade / update to iOS 8 Beta 4 Firmware via OTA (Over-the-Air) wirelessly; Just navigate to Settings > General > Software Update option on your device settings. If you're registered iOS developer, then visit iOS Dev Center website for official iOS 8 Beta 4 (Build: 12A4331d) Downloads, If you're non-registered non-developer (general user), then manually download, install and activate iOS 8 Beta 4 via iTunes without Apple UDID registration and without the requirement of iOS Developer account via the official Direct Download Links of iOS 8 Beta 4 IPSW Firmwares for iPad Air 5G, iPad 4G, iPad Mini, iPad Mini 2, iPad 3G, iPad 2G, iPhone 5S, iPhone 5C, iPhone 5, iPhone 4S, iPod Touch 5G and Apple TV 3G via Direct Links exclusively available below. No untethered iOS 8 Beta 4 Jailbreak is available from team "evad3rs" (Evasi0n8 Jailbreak Tool) or team "Pangu" (Pangu iOS 8 Jailbreak Tool).